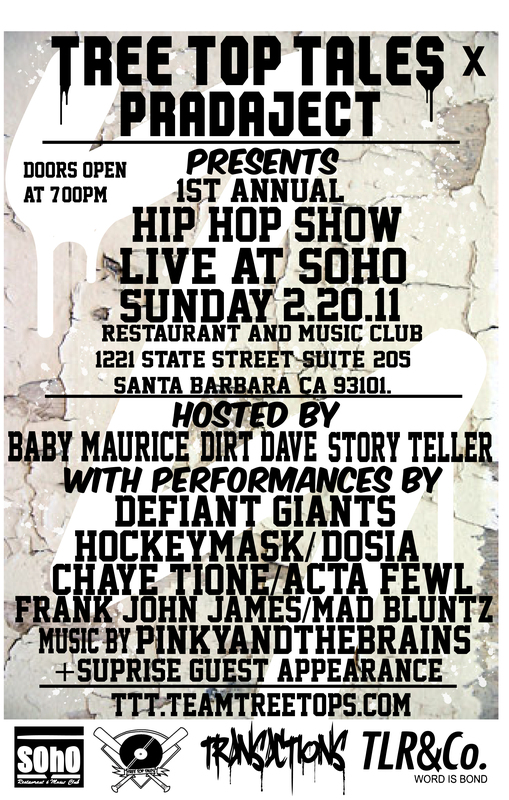 Tree Top Tales Presents 1st Annual Hip Hop Jam Live at SOhO Restaurant and Music Club in Santa Barbara. Doors open at 7:00PM and will go all night. Tree Tops own Baby Maurice, Story Tella, And Dirt Dave will be hosting and playing live music. DJ Al Doe and more. First 20 people get 2×1 cover charge and a Tree Top Tales Mixtape. Tickets are available for $10.00 @ the door. Call 805 450 1508 for pre sale. 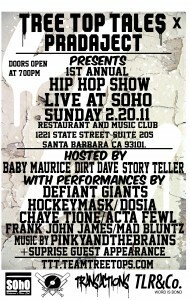 Come out and support Tree Top Tales Radio and Real Hip Hop! HECK YEAH! ill be the dude wearing Terminator vision glasses.